Ogushi Kaizuka Park (大串貝塚ふれあい公園) is located in Mito, Ibaraki Prefecture. This was used to be the village in ancient Japan. Therefore, it is registered as the national historic site. Legendary Giant, Daidarabou 15m tall. There is Kaizuka which is a shell mound of 5000 years ago. There are traditional residences that restored in ancient Japan. 1. use Oarai Kashima Line Tsunezumi Station. Ogushi Kaizuka Fureai Park is located in Mito, Ibaraki Prefecture. There is a 5000 years old shell mound which is the oldest shell mound in the world appears in the record of Nara period. The legendary Giant. 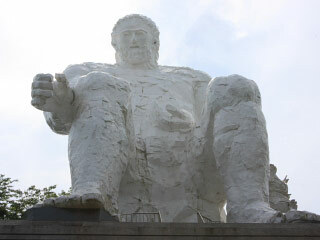 The statue is 15m tall. There is a restored residence from Jomon to Kofun Period.